The Kelpies and Helix Park are situated on the east side of Falkirk. The image below shows the Helix, a large park opened in 2013 for recreation with a cafe, mobile food stalls, kids slides, swings, water features, large grassland for sports, and lake with different types of boats for hire including pedalos. The paths are popular for skate boarding, roller skating, jogging and cycling. The Splash Play Zone with intermittent water jets is popular with young kids, you never know what ones the water is going to come out. Best take a change of clothes for kids. The Kelpies, large metal horse sculptures, opened to the public in 2014. The car park at the Helix is free, the larger car park about 400 yards further into the park for the Kelpies costs about £2. The image below is of the Kelpies from the canal by the large car park. It is about a 200 yard walk from this car park. The Kelpies were designed by the sculptor Andy Scott as a monument to the heavy horses that worked on the canals. You can book a tour of inside the sculptures, and learn about their design and construction. Kelpie is a name given to a water spirit appearing in the lochs and pools of Scotland, usually in the form of a horse. There is a large cafe/restaurant at the Kelpies and a few food / ice cream stalls. This is where the Forth and Clyde Canal starts, from the River Carron and Firth of Forth. The canal runs 35 miles to the west side of Glasgow, at the village of Bowling, where it enters the Firth of Clyde. It is 4 miles from the Kelpies to the Falkirk Wheel on the west side of Falkirk. The Falkirk Wheel is a rotating boat lift, opened in 2002 to replace 11 locks. The canals were closed from the 1960s until a massive restoration project began in the 1990s. 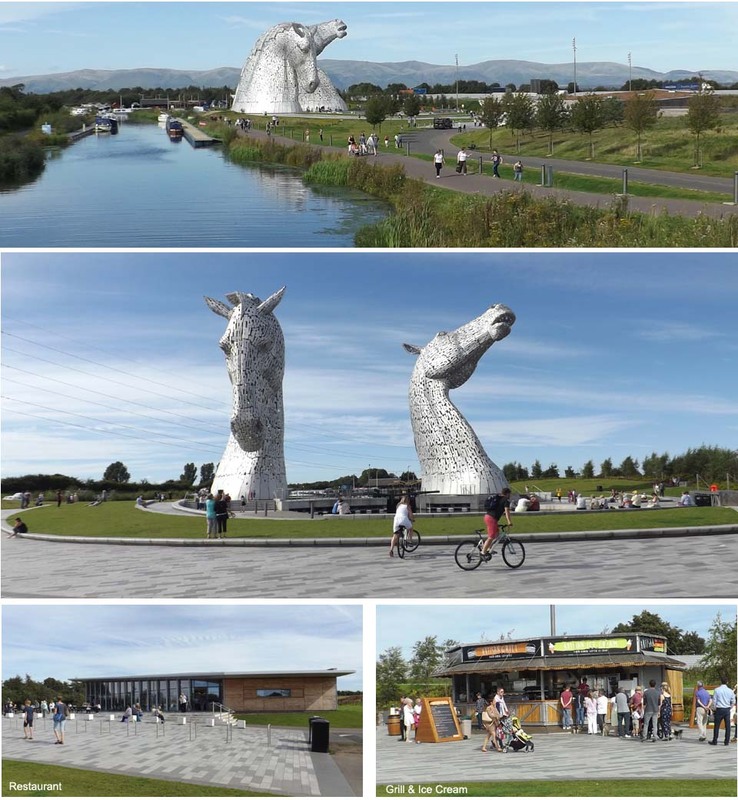 There is a cycle / walking path between the Kelpies and Falkirk Wheel, with cycle hire at the Falkirk Wheel and in Falkirk. There are also regular buses that run between the Helix, Falkirk centre, and the Falkirk Wheel. The Falkirk Wheel soon became a top tourist attraction with a visitor centre, cafe/restaurant, and boat rips on the canal using the Falkirk Wheel. In 2015, kids play areas and many water sports were added to the complex. The walking / cycle path runs all the way to Glasgow alongside the canal, see the Falkirk Wheel for more information and history.